A regular breeding resident and migrant found statewide; a regular species during the winter months throughout the state but most common in the Twin Cities metropolitan region and southeastern Minnesota. The Mourning Dove was a very abundant species during the Minnesota Breeding Bird Atlas (MNBBA). Found throughout much of North America, the Mourning Dove’s breeding range extends from the southern regions of the central Canadian provinces, east to the Maritime Provinces, south across the entire United States, and farther south into Central America. It is a year-round resident throughout most of its range with the exception of the southern Canadian provinces from British Columbia east to Quebec and through the northern Great Plains and Upper Midwest. Within North America it reaches some of its highest breeding densities in the Great Plains, the upper midwestern states of Illinois, Indiana, and Ohio, and in the southeastern states (Figure 1). A game species, the Mourning Dove has been assigned a Continental Concern Score of 6/20 by Partners in Flight. Resident to long-distance migrant; most northern populations migrate. Birds in the north-central states winter from Texas and the Gulf Coast states south into Mexico and Central America. A ground forager feeding almost entirely on the small seeds of cultivated grains as well as many grasses and forbs. A loose platform of twigs placed in a tree or shrub. Breeding distribution and relative abundance of the Mourning Dove in North America based on the federal Breeding Bird Survey from 2011 to 2015 (Sauer et al. 2017). The Mourning Dove has always been recognized as a common and abundant summer resident throughout Minnesota, with the exception of the far northeastern and north-central counties, where it is uncommon. When Roberts wrote his treatise on the birds of Minnesota in 1932, he noted that the Mourning Dove was one of the few birds in the state that had increased in abundance. “It was always common but it is now abundant and getting more so each year. With the clearing and the settling of the northern forests it has appeared in many localities where it was formerly absent.” He speculated that a decrease in the number of predatory hawks and owls due to persecution also may have contributed to the dove’s improved status. Mourning Dove nests are relatively easy to find. Roberts documented nesting in 12 counties, ranging from Rock, Pipestone, and Jackson in the southwest, east to Waseca and Goodhue, north to the east-central counties of McLeod, Hennepin, Anoka, Isanti, and Sherburne, and then northwest to Polk and Kittson. Little changed regarding the dove’s status in the following years. Both Green and Janssen (1975) and Janssen (1987) noted the species was absent from Cook and Lake Counties and the extensively forested portions of Itasca, Koochiching, and St. Louis Counties. It reached its greatest abundance in the southern and western agricultural regions of the state. Janssen (1987) included a map delineating 48 counties where nesting had been confirmed since 1970. Hertzel and Janssen (1998) added another 11 counties to the map, including St. Louis County. The Minnesota Biological Survey further confirmed the species’ common occurrence outside of the Laurentian Mixed Forest Province, where it was sparsely distributed. Although the Mourning Dove was uncommon in the northern forest, numerous locations were documented in the surveyed portions of Itasca and St. Louis Counties as well as one record in northern Lake County (Minnesota Department of Natural Resources 2016). During the MNBBA, observers reported a total of 6,125 Mourning Dove records in 60.9% (2,948/4,842) of the surveyed atlas blocks and in 75.9% (1,773/2,337) of the priority blocks. Breeding evidence was documented in 493 blocks (Figures 2 and 3; Table 1). Although least abundant in the northern and eastern regions of the Laurentian Mixed Forest Province, the birds were observed in all 87 Minnesota counties. Breeding evidence was gathered from 78 counties; 8 of the 9 counties where breeding was not documented were in northeastern and north-central Minnesota. Twenty of the counties with confirmed breeding were additions to the list published in 1998 by Hertzel and Janssen. The Minnesota predicted probability map emphasizes the Mourning Dove’s abundance and widespread distribution throughout the Eastern Broadleaf Forest, Prairie Parkland, and Tallgrass Aspen Parklands Provinces (Figure 4). In the Laurentian Mixed Forest Province, it is predicted to be most abundant in areas of urban and industrial development, small towns, and agricultural lands, for example, in Duluth and along the Iron Range. Statewide some of the highest densities are predicted in scattered areas throughout the Prairie Parkland Province. Biologists believe Mourning Doves were present prior to European settlement in scattered locations across much of the United States and southern Canada (Otis et al. 2008). As human settlement progressed to the north and west, their numbers increased, and their range expanded even farther, including throughout New England and across southern Canada. Although clearing the eastern deciduous forest undoubtedly created extensive suitable habitat for doves, the two most important factors that favored the species were plowing the central grasslands for agriculture and introducing irrigation in the central and western states for cereal production (Tacha and Braun 1994). The MNBBA documented that the Mourning Dove remains least abundant in northeastern and far north-central Minnesota, but it clearly has slowly expanded its distribution and abundance in this region over the past 50 to 100 years. Similar changes have been noted in other states in the Upper Midwest. Michigan, for example, documented a significant increase in the number of Mourning Dove detections in the Upper Peninsula between their first atlas (1983–1988) and second atlas (2002–2008). The percentage of townships recording doves nearly doubled, from 36% to 68% (Chartier et al. 2013). Ontario also witnessed “a significant northward shift” in the species’ range in the 20 years between their first (1981–1985) and second atlas (2001–2005; Cadman et al. 2007). Breeding distribution of the Mourning Dove in Minnesota based on the Breeding Bird Atlas (2009 – 2013). Summary statistics of observations by breeding status category for the Mourning Dove in Minnesota based on all blocks (each 5 km x 5 km) surveyed during the Breeding Bird Atlas (2009-2013). Summary statistics for the Mourning Dove observations by breeding status category for all blocks and priority blocks (each 5 km x 5 km) surveyed during the Minnesota Breeding Bird Atlas (2009-2013). Predicted breeding distribution (birds detected per 10-minute point count) of the Mourning Dove in Minnesota based on habitat, landscape context, and climate data gathered during the Minnesota Breeding Bird Atlas (2009-2013) using the General Linear Modeling method without an adjustment for detectability. A bird of the open country, the Mourning Dove is most frequently associated with farmsteads, open woodlands, edges of agricultural fields, suburbs, and forest clearings (Figure 5). The only areas the doves strictly avoid are extensively forested landscapes. They reach their highest abundance in areas that provide trees for nesting, perches for calling, and open ground for foraging (Kaufman 1996). Habitat data collected at MNBBA point counts where Mourning Doves were detected show the species strong association with open landscapes including croplands, grasslands, development, and wet meadows, as well as with oak forests (Figure 6). Oak forests or woodlands are largely present in the fragmented landscapes of southern and central Minnesota. Typical breeding habitat of the Mourning Dove in Minnesota (© Lee A. Pfannmuller). Habitat profile for the Mourning Dove based on habitats within 200 m of point counts where the species was present during the Minnesota Breeding Bird Atlas (2009-2013). Data gathered by the federal Breeding Bird Survey (BBS) have been used to generate a North American population estimate of 130 million Mourning Doves (Rosenberg et al. 2016). In 2013 Partners in Flight estimated that Minnesota supported 1.8% of the North American population, which, using the 2016 estimate, would place the Minnesota population at approximately 2.3 million birds (Partners in Flight Science Committee 2013). Indeed, Mourning Doves are so abundant that they ranked second in abundance to the most numerous species, the Red-winged Blackbird, along all BBS routes in North America in 1989 (Droege and Sauer 1990). As prevalent as Mourning Doves are in Minnesota, the core of their breeding range is farther south and west of the state. They reach particularly high densities in the central Great Plains states of western Nebraska and Kansas. An average of 106 doves are observed on BBS routes in the Central Grass Mixed Prairie Region. This compares to an average of only 32 doves per route in Minnesota (Sauer et al. 2017). Because the Mourning Dove is a popular game species, a coordinated effort to effectively monitor dove populations began in 1953 (Tacha and Braun 1994). Using a technique similar to the BBS, national call count surveys were conducted along 20-mile routes. The surveyor stopped every mile and recorded the number of dove calls heard within a three-minute period from late May to early June. Unfortunately the original routes did not adequately cover the species’ entire range and were concentrated around local communities. They were replaced by randomized routes in 1966 (Tacha and Braun 1994). Nearly 50 years later, in 2013, federal coordination of the survey was discontinued because data were insufficient to generate valid population abundance estimates to guide harvest management (Seamans 2015). Many states, however, continue to conduct the call counts, including Minnesota. The BBS provided more effective coverage in a given state than the call survey and presumably more reliable monitoring data. In Minnesota, for example, the call count survey is conducted along only 13 to 14 20-mile-long routes, while the BBS is conducted along 84 25-mile-long routes, of which more than 85% have been surveyed in recent years. Nevertheless, there is considerable debate among dove biologists about the merits of the BBS for effective monitoring of Mourning Dove populations and its ability to provide sufficient data to guide important harvest management decisions (National Mourning Dove Planning Committee 2005). Today dove biologists rely on multiple sources of information, including BBS data, banding data, and harvest survey statistics to inform management decisions (Seamans 2015). Despite the limitations of the call count and BBS surveys, they both provide reasonable indices of population trends and corroborate one another. 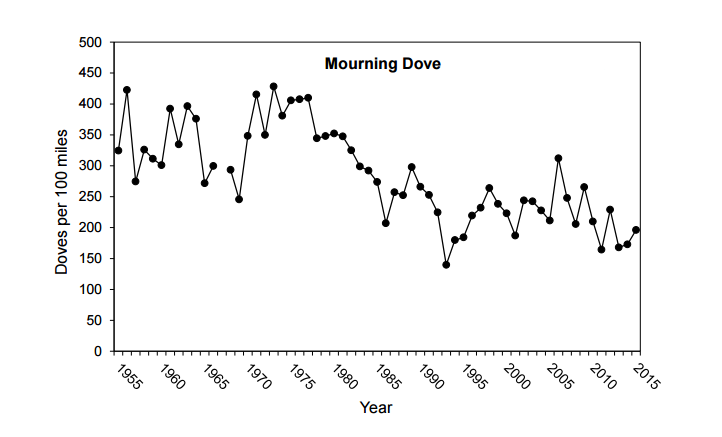 The call count survey demonstrates a consistent downward trend in dove populations across the United States from 1966 through 2013 (Seamans et al. 2013). At the state level, Minnesota call count data also illustrate a downward trend, although the decline is most significant from the mid-1970s through the mid-1990s, the data showing a more stable trend in the most recent 20 years (Figure 7). The BBS data also demonstrates a significant and consistent downward trend across North America and in Minnesota. Across the entire survey area, the dove has experienced a statistically significant decline of 0.3% per year since 1966 (Sauer et al. 2017). The downward trend has been steeper in Minnesota, where the population has declined an average of 1.0% per year since 1967 (Figure 8). Factors responsible for the decline are speculative at best but include large-scale changes to agricultural practices that are more intensive, frequently eliminating shelterbelts and windbreaks that provide suitable nesting habitat for doves. Loss of habitat due to increasing residential development is also cited as a concern. Annual call-counts for Mourning Doves in Minnesota, 1955-2015 (includes all survey routes except those in northwestern Minnesota; Davros 2015). 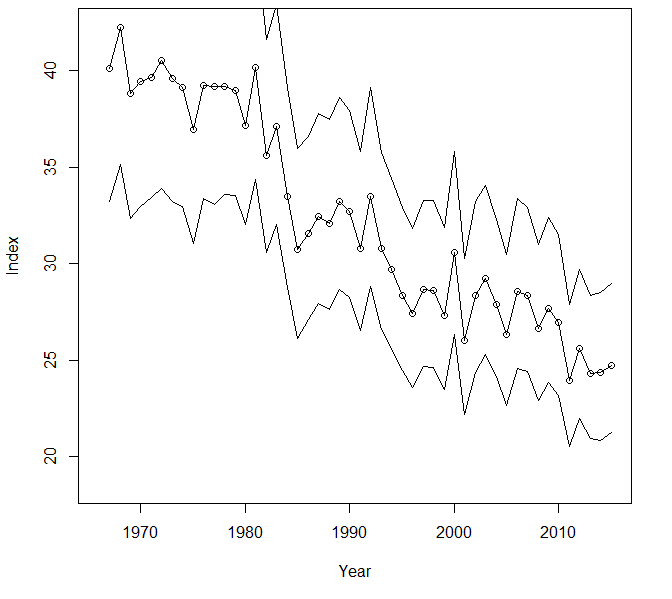 Breeding population trend for the Mourning Dove in Minnesota for 1967-2015 based on the federal Breeding Bird Survey (Sauer et al. 2017). Despite its declining population trend, the Mourning Dove is still an abundant species well adapted to human-modified landscapes. As a result, it is not considered a conservation priority at either the federal or state level. It has been assigned a relatively low Continental Concern Score of 6/20 by Partners in Flight (Rosenberg et al. 2016). Unlike for many species, a warming climate poses no significant threats to the dove (North American Bird Conservation Initiative 2010). As a popular game species, the dove is intensively managed. Since the mid-1950s, biologists have delineated three clearly defined populations that, based on band recovery data, have been considered largely independent of one another: the Eastern Management Unit (east of the Mississippi River), the Central Management Unit (largely the Great Plains south through Texas); and the Western Management Unit (Tacha and Braun 1994). All management decisions are made within a framework defined by these three populations. A National Strategic Harvest Management Plan was approved in 2005 to provide “a long-range vision for improving mourning dove management through the development of predictive harvest strategies” (National Mourning Dove Planning Committee 2005). Minnesota recently reinstated the Mourning Dove to the list of harvested species in the state. After allowing legal hunting for 42 years, between 1899 and 1946, the state legislature removed it from the list of game birds in 1947 (Henderson 1980). Nearly 40 years later, hunters were anxious to reinstate its game bird status, prompting the introduction of several legislative initiatives. The subject of intense public debate among hunter advocacy groups, citizens, biologists, and animal protection groups, the efforts failed until 2004, when the legislature succeeded in passing legislation to add the Mourning Dove to the list of migratory game birds. In the 11-year period from 2004 to 2014, an average of 11,270 hunters per season harvested approximately 96,000 birds each fall (ranging from 74,000 in 2011 to 132,000 in 2008; data extracted from Minnesota Department of Natural Resources Small Game Hunter Mail Surveys, 2004–2014, Dexter 2016). This compares to an average annual harvest of approximately 21,000 birds in the early 1900s (Johnson et al. 1967). During the 2014 fall harvest season in the United States, about 13.8 million birds were harvested by 840,000 hunters (Seamans 2015). Because it is such an intensively harvested species, particularly in the southern states, considerable attention has focused recently on the bird’s ingestion of spent lead shot. Indeed, some agricultural fields are managed with the intent of attracting flocking birds in the fall for harvest. If these sites receive a lot of hunting pressure, lead shot can accumulate in the fields and be ingested by doves and other wildlife. One recent study found the frequency of ingested lead shot in the gizzards of doves was 2.5% on sites where lead shot was permitted, and 2.4% on sites where nontoxic shot was required (Franson et al. 2009). Nevertheless, the concentration of lead in the bones of birds without ingested lead pellets was lower on areas requiring nontoxic shot than on areas that allowed it. Many questions still need to be addressed, not the least of which is determining how many doves die of lead poisoning each year. One study suggested that the annual losses approximate those losses attributed to the annual harvest (Schulz et al. 2006). In Minnesota the use of nontoxic shot is not required when hunting doves unless the hunting takes place on federal wildlife refuges and waterfowl production areas (Minnesota Department of Natural Resources 2015). Relative to other states, harvest pressure on Mourning Doves in Minnesota remains relatively low. One outdoor writer suggested the 60-year ban on hunting was one important factor for the low interest. Minnesota hunters already have a smorgasbord of hunting opportunities in the fall, each having a strong tradition among hunters (e.g., deer, grouse, waterfowl, and bear). Such traditions may preclude the dove from ever becoming a highly sought-after species in the state (Smith 2014). Today the Mourning Dove is an abundant species in Minnesota. Its overall popularity as a game bird throughout North America will insure that factors that may threaten populations will be the focus of intensive research and management. Johnson, Roger Norman, Marvin R. Kohout, and Maynard M. Nelson. 1967. Minnesota Game Population Statistics, Harvest, and Hunting Regulations 1919–1966. St. Paul, MN: Department of Conservation. Minnesota Department of Natural Resources. 2015. 2015 Minnesota Hunting and Trapping Regulations Handbook. St. Paul: Minnesota Department of Natural Resources. National Mourning Dove Planning Committee. 2005. Mourning Dove National Strategic Harvest Management Plan. Prepared with input from The Pacific Flyway Study Committee, Central Flyway Webless Migratory Game Bird Technical Committee, and Eastern Management Unit Dove Technical Committee. Washington, DC: U.S. Department of the Interior. Schulz, John H., Paul I. Padding, and Joshua J. Millspaugh. 2006. “Will Mourning Dove Crippling Rates Increase with Nontoxic-Shot Regulations?” Wildlife Society Bulletin 34: 861–865. Tacha, Thomas C., and Clait E. Braun. 1994. Migratory Shore and Upland Game Bird Management in North America. Lawrence, KS: Allen Press.